Dos and Don'ts of nail care for your kid. Teaching your child and ensuring that he washes his hand is the best way to prevent infections and spread of germs. Nails are needed to protect the sensitive tips of fingers and toes. Making your child aware that his nails should be neatly trimmed and kept clean to avoid infections is of utmost importance. Fingernails are composed of laminated layers of a protein called keratin that grow from the area at the base of the nail, under the cuticle. As new cells grow, older cells become hard and compacted and are eventually pushed out towards your fingertips. Healthy nails are smooth, without any pits or grooves, uniform in colour and free from spots. Nails can also develop white lines or spots due to injury, but these eventually grow out with the nail. Teaching your child the following tips on Do's and Don'ts will help them have healthy nail-care habits. • Keep your child's nails trimmed and filed. Short nails break less often and remain cleaner. • Teach your child to dry his hands well. If kept wet for a longer duration, it can cause infection. • Your child's shoes should have plenty of space for toes to wiggle. Cramped toes may lead to ingrowths. • Apply moisturizer to the nails and cuticle every night before your child goes to sleep. • Keep your child's nails dry and clean to prevent bacteria, fungi and other organisms from growing under their nails. • Make sure that your child does not use his nails to poke, prick or pry into things as it may damage his nails. • Do not rip off hangnails as you may rip off the live tissue along with it which may lead to pain, swelling and infection. 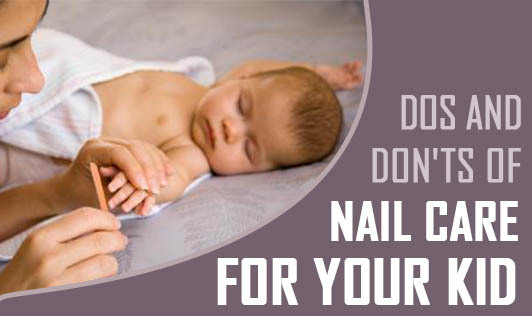 • Make sure that your child does not bite his nails or cuticle. Even a small cut or damage to the nail bed would allow bacteria to enter and cause infection. • Do not ignore nail problems as they are most often associated with other health problems. • Make sure that your child eats foods that keep his nails healthy and strong like meat, fish, walnuts, almonds and eggs that are rich in protein and vitamin B7 (biotin). The best practice is to pay attention to your child's nails and note any lasting changes to their color, texture or shape, especially if these changes are accompanied by other changes in their general health. Report your concerns to your physician for a diagnosis.